Tonight, the University, in partnership with WJXT, welcomed Florida Commissioner of Agriculture Adam Putnam and U.S. Representative Ron DeSantis for the second of only two debates prior to Florida’s Republican gubernatorial primary Aug. 28. 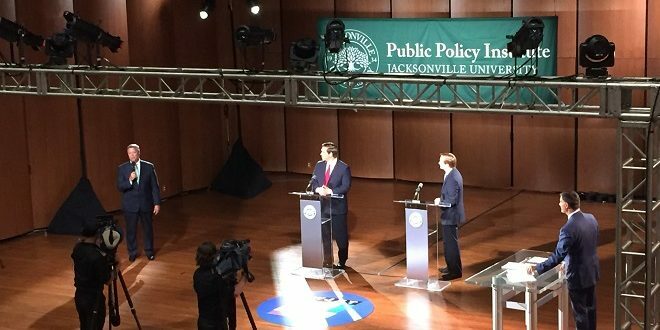 You can watch the full debate online through WJXT. More than a week after President Donald Trump endorsed DeSantis, the hour-long debate focused on several issues facing Floridians, including gun control and Stand Your Ground legislation, school safety, seaports and dredging, jobs and the economy, immigration, the environment and water management, healthcare, and charter schools. President Tim Cost welcomed the more than 300 guests and Kent Justice of WJXT moderated. The 60-90-30-second response and rebut format was held in front of a live audience. Jacksonville residents, area students, elected officials, and campaign supporters were in attendance. The evening opened with the promise of a Florida-centric line of questioning. “This is the place to be tonight. We enjoy a great partnership with Jacksonville University, and this is a terrific event for our state,” President Cost said. Some have argued that televised debates are rarely game changers. For Floridians, voting by mail has already begun. The deadline to request mail-in ballots is Aug. 22. All 67 Florida counties will offer early voting opportunities and locations starting Aug. 18 statewide. However, the unprecedented debate activity of the 2016 presidential election season, both those televised and those that propagated across social media platforms, has challenged this line of thinking. Tonight’s debate drew a packed crowd, several attendees vying for seat reservations at the last hour. During the University’s pre-planning of the event, Director of the Institute Rick Mullaney said, “The Florida Governor’s race is one of the most important in the nation,” noting Florida as a critical swing state. 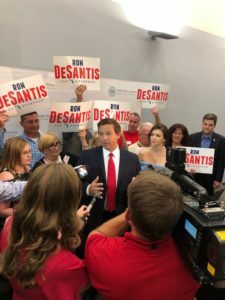 He attended along with many other familiar faces from Florida politics—Florida Senator Aaron Bean, former mayor John Peyton, Sheriff Mike Williams, Jacksonville City Council members, and many other influencers at the state and local level. Since 1964, the Florida vote has accurately predicted the winning presidential candidate every election except one. In addition, the Sunshine State remains incredibly competitive when it comes to both presidential and gubernatorial races. Victors often walk away with only a one percent lead. Because of Florida’s historically pivotal role in national politics, local and national media were also in attendance—The Wall Street Journal, FOX News, Associated Press (AP)—interviewing candidates directly after the debate. Tonight marked the last debate forum for DeSantis and Putnam, the final opportunity of this kind to speak face-to-face with voters. Supporters of both candidates attended en masse, with red or blue signs waving. 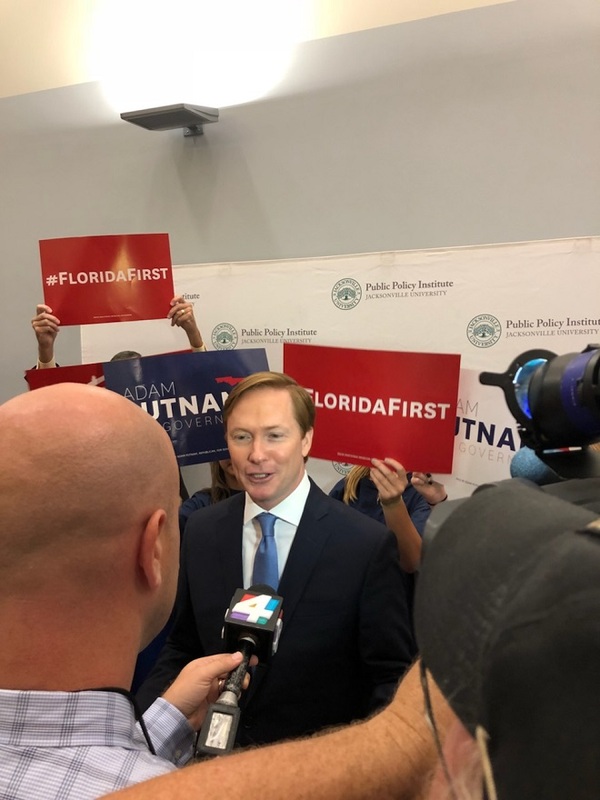 In Putnam’s closing statement, he touched on Florida’s opioid crisis, supporting law enforcement and faith-based initiatives, and school choice. DeSantis closed with discussion on economic growth, educational reform, protecting Florida’s natural resources, sanctuary cities, and E-Verify. Seven moderated live debates have been hosted by the University in the six years since the Institute’s establishment. Other organizations and officials to utilize JU as a community gathering point include Mayor Lenny Curry, Gov. Rick Scott, and 2016 Libertarian Vice Presidential Candidate Bill Weld, to name a few. Through the Institute, graduate students have direct access to policymakers, civic leaders, elected officials, and a wide variety of local, state, and federal level candidates. The list of special speakers and VIP guests since the Institute’s inception is long and storied, including recent Supreme Court hopeful and U.S. Court of Appeals Seventh Circuit Judge Amy Coney Barrett; Florida House Speaker Will Weatherford; former U.S. Sen. Bob Graham; U.S. Rep. Ander Crenshaw; U.S. Rep. John Rutherford; State Attorney General Pam Bondi; former U.S. Ambassador to the U.N. Nancy Soderberg; and former U.S. Reps. David Jolly and Patrick Murphy, along with many other distinguished speakers. On Thursday, Aug. 9, Democratic gubernatorial candidates Andrew Gillum, Mayor of Tallahassee; Gwen Graham, former Congresswoman for Florida’s Second Congressional District; Chris King, Winter Park businessman; real estate entrepreneur Jeff Greene; and Philip Levine, former Mayor of Miami Beach, will participate in a town hall. Open to the public and held in the Jacksonville University Terry Concert Hall, tickets have all but disappeared for tomorrow’s town hall. WJXT will stream the event at News4jax.com. Republican Gov. 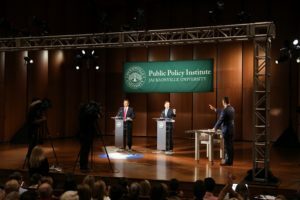 Rick Scott and incumbent Democratic U.S. Sen. Bill Nelson have agreed to stand on the debate stage at Jacksonville University in October. For more information about this event or the Institute, visit ju.edu/publicpolicy, email the Institute at ppi@ju.edu, or contact Fowler Martens at (904) 256-7053 and fmarten@ju.edu.